DOWIN International Corp. is a company specialized in manufacturing and export of the hydraulic breaker and excavator attachment. It started business in 1999 as a professional component exporter of construction machinery and has been incorporated up to the present since August 2002 due to expansion of business. DOWIN T series breakers are very powerful and productive thanks to the cylinder embedded control valve system. DOWIN T series breakers are designed to harmonize the long piston stroke with a nitrogen cushion on the top of the piston, creating less shock and vibration than competing breakers. Superior quality alloy steel provides excellent durability and longer life. The Box Type breaker was developed to minimize noise during operation, with the use of sound absorbing materials and noise reducing frame design, which is very useful in the job sites of urban areas. DOWIN T series provides a variety of selections with a diversified range of 14 models. The pressurized N2 gas in the main power cell is designed to operate with less demand on the base machine hydraulic power. Minimized inner parts facilitate easy maintenance with lower costs. DOWIN International obtained international certifications such as ISO9001 & 14000, and CE in 2005, Gost-R in 2007, etc. 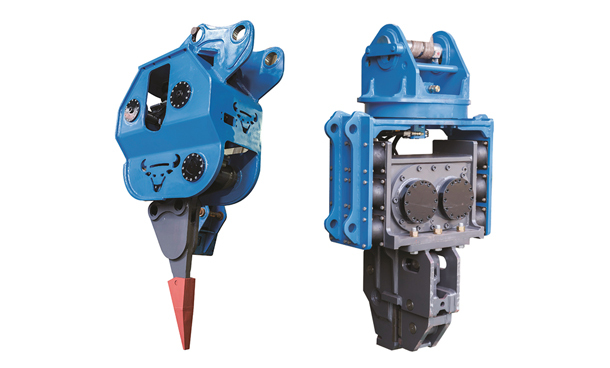 In particular, due to strengthening of business and marketing activities targeting growth areas all over the world since 2005, the export scale of the hydraulic breaker, our flagship item, has been increased year by year. DOWIN International considers it business policy to create a solid company meeting the satisfaction of the shareholders, employees and customers through constant management innovation, rather than merely through growth by appearance. DOWIN International pursues development of the company with the best quality, reasonable pricing policy and market-leading business activities. Since its establishment in 2004, Ace Hammer Co., Ltd. developed its brand in the local market, and soon its products were mostly welcomed by overseas customers. Despite its humble beginnings, when the company started to export its goods on an OEM basis, its reputation has slowly spread in the global market. Currently, the company has enjoyable relationships with its valuable customers based on trust. demolition grapples, compactors, shear straight cutters, etc. These products are characterized by their great strength such as superior power & efficiency, reliability, extended durability and simple application & easy maintenance. They are manufactured with high-quality alloy steel for extended durability. Also, they come with precision welding breaker holder and wide diameter tool with dust-protection lip shields debris. Simple valve design is for simple application and easy maintenance. Tool bushing is engineered for quick & easy replacement. [INQ. NO. 1507M11] S & C’s auto ripper reduces noise more than 10dB compared with hydraulic breakers and achieves two to five times higher performance covering 70% of all different types of working sites compared to hydraulic breakers. Most field works such as breaking, ripping and crushed rubble handling can be performed simultaneously. The auto ripper carries out construction work even in city zones in places sensitive to machine noise. It minimizes an operator’s vibration fatigue compared to other ripper machines, and the operator’s preference for this fatigue relief can contribute to high job efficiency. Construction work in rivers and ocean coastlines is possible without extra optional devices. The machine protection design from ripper’s high vibration is applied. The end-users can enjoy lower maintenance cost than the former hydraulic breaker’s. With additional option devices, the ripper can be used as compactor or pile-driving hammer. S & C has consistently grown based on the spirit of sincerity and challenge as its foundation ideology even in difficult internal and external circumstances since the establishment of the company in 2000. S & C has been a successful strategic partner with Doosan Infracore and should be for many years to come. The rapidly changing market environment is always demanding proactive footwork. And S & C worked its strategies of business diversification for challenge motives and put them into practice. Filed Under: New & hot Tagged With: Auto ripper, breaking, crushed rubble handling, Hydraulic breakers, ripping, S&C Co. Ltd.
INQ. NO. 1410M03] S&C has consistently grown based on the spirit of sincerity and challenge as its foundation ideology even in difficult internal and external circumstances since the establishment of the company in 2000. S&C has, meanwhile, achieved improvements in fabrication and machining technology capability. And S&C has been a successful strategic partner with Doosan Infracore and should be for many years to come. The rapidly changing market environment is always demanding proactive footwork. And S&C worked its strategies of business diversification for challenge motives and put them into practice. With different perspectives from Doosan machine parts business, it successfully challenged the new business of industrial machinery and attachment business from 2007 and built up valuable experience in providing clients with customized products. As one of current products, S&C’s auto ripper reduces noise more than 10dB compared with hydraulic breakers and achieves two to five times higher performance covering 70% of all different types of working sites compared to hydraulic breakers. Most field works such as breaking, ripping and crushed rubble handling can be performed simultaneously. The auto ripper carries out construction work even in city zones in places sensitive to machine noise. It minimizes an operator’s vibration fatigue compared to other ripper machines, and the operator’s preference for this fatigue relief can contribute to high job efficiency. The company’s well developed and widely known technical know-how attracted OEM product contract with one of the Japanese leading companies for construction machine attachments in 2010. Its workmen and all company organizations have adapted to their world-best quality enforcement and its outcomes have been carried out successfully. And its necessary and sufficient qualified service has expanded supply volume as well. Furthermore, its OEM experience opened new prospects for its own brand attachment business. And currently it will be its core business category in the medium and longer term. In the meantime, its management received high praise from external assessment institutes. Its award winnings were the Certification of Quality Management System in 2006, Certification of Clean Factory in 2007, Certification of Venture Corporation in 2009, INNO-BIZ Corporation in 2011, VISION Corporation in 2012. Filed Under: Machinery Tagged With: Auto ripper, breaking, crushed rubble handling, Hydraulic breakers, ripping, S&C Co. Ltd.
[INQ. NO. 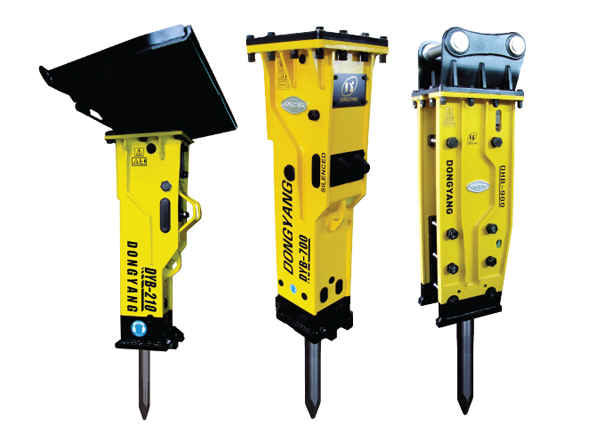 1409M01] Dongyang Heavy Industries has developed and manufactured various types of standard and customized hydraulic breakers as well as demolition attachments including quick couplers, hydraulic compacters, crushers, grapples and rippers. Designed to ensure maximum performance with high durability, the breakers’ high capability and reliability have been proved on various construction sites for more than 23 years, fulfilling customers’ demanding requirements. Their optimal design and precise torque-based assembly greatly reduce the vibration, while safe but powerful hydraulic cylinder maximizing the impart power. The industry’s easiest and lowest cost body re-build system makes easy disassembling and effective maintenance possible with affordable cost. The breakers also employ hardox at the bracket, not only applying optimized structure and materials from the largest to the smallest part, boasting remarkable durability even in unfavorable working conditions. When it comes to demolition, operators consider high impart power and durability the most important. 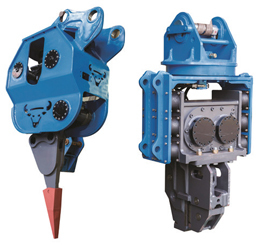 Dongyang’s breaker satisfies their needs with mighty power and reliability. The hydraulic-breaker is widely applicable to road construction, building innovation, tunneling, trenching, quarry works, etc.